"In October of 2018, hundreds of young conservatives of color met up in Washington, DC, for the first ever Young Black Leadership Summit: a four-day conference that featured speeches from conservative actress Stacey Dash and firebrand Candace Owens, a trip to the White House to hear Trump speak, and a rare chance for young, black Republicans to get together and network IRL. VICE’s Lee Adams went to the summit to talk firsthand with young, black conservatives about what drew them to the Republican party, along with what kind of backlash they’ve faced from the black community for going public with their political views. To find out more about the movement, he also tagged along with Antonia Okafor—an outspoken Second Amendment activist—on a hunting trip in northwestern Iowa with Steve King, a House Rep who’s been widely criticized for his racist comments. Lastly, he met up with Shekinah Geist, a black Republican and budding social media influencer, and sat in on a conversation between her and a group of peers from the local black student union who challenged her on her support for President Trump." ME: The day that just 20% of African Americans see the light and see the Democrats as the KKK slave masters they are is the day that the baby-killing party of death, the Democrats, will end. Now THAT is Hope I can believe in! Quoting Seth Meyers. Wow. You really reach for the intellectual starts don't you. You are so insulting to these young people finding there way that its pathetic. 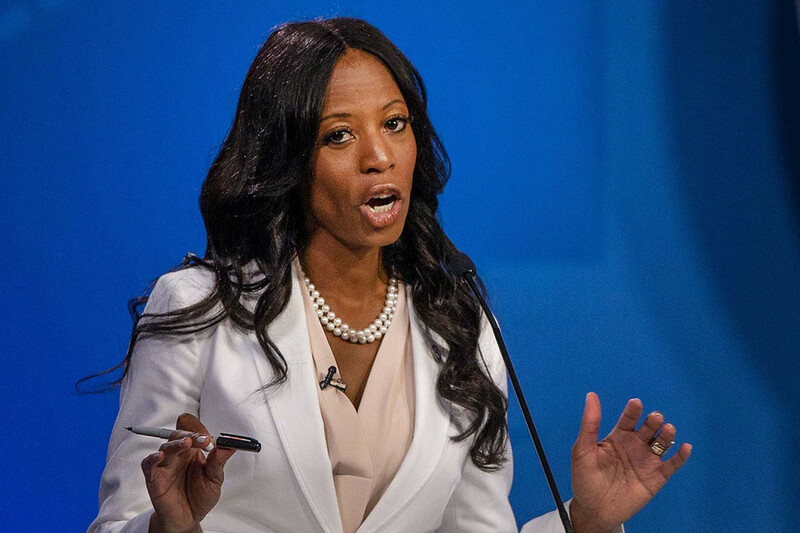 Rep. Mia Love on Monday said President Donald Trump has "no real relationships, just convenient transactions," after the leader of her political party bashed her for not embracing him ahead of this month's midterm elections. On the day after the midterms, which resulted in Democrats retaking control of the House, Trump called out a number of GOP lawmakers who he said had not embraced him and lost their races as a result. Love's race had not been called at that point, but Trump tacked her onto his list anyway. "Mia Love. I saw Mia Love, and she would call me all the time to help her with a hostage situation, being held hostage in Venezuela," the president said at the time, referring to Utahan Josh Holt, who had been held by the Venezuelan government. "But Mia Love gave me no love. And she lost. Too bad. Sorry about that, Mia," Trump said at the Nov. 7 news conference. Love said the election shone "a spotlight on the problems Washington politicians have with minorities and black Americans." She said that politicians claim to know what's best for communities of color but that Republicans "never take minority communities into their home and citizens into their homes and into their hearts." Apparently Rep. Mia Love (R - Utah), the first and only black Republican woman elected to Congress does not share "CatholicCrusader's" optimistic assertion that the Republican Party wishes to embrace "Black Americans!" Last edited by jgarden; February 3rd, 2019 at 07:54 PM. can you imagine a debate between the two?